Today was the day my grandparents were married many many years ago. To celebrate, they would always go on a May Walk as they called it. 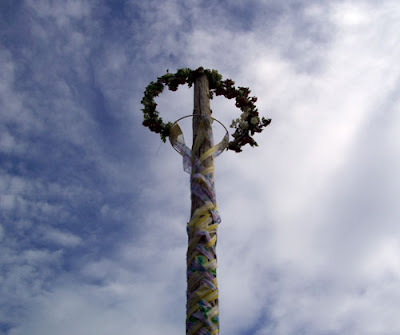 They had a pole in their basement kitchen that had ribbons attached to it, and all us grandkids would weave in and out of each other dancing around the May Pole. Has anyone guessed the day yet? It is May Day! 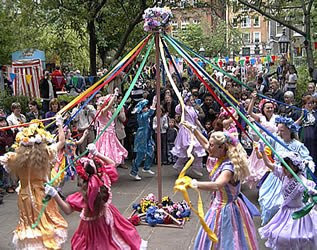 I don't know why, but I really love May Day. I think most people have never heard of it, but it is a day that I associate with so much warmth and happiness. Traditionally a fire is built. I don't have a fireplace or a firepit, so I may just have to light candles all around my house, and pray that a real fire doesn't follow. They also celebrate with lots of flowers. I have lots of pretty yellow flowers growing in my lawn that need to be disposed of, so my sweet son and I will go out and pick them, and place them in baskets through out my house. I am also going to make some sort of yummy pastry. I don't know what kind yet, but I just feel like baking. Hot cross buns (which remind me of my grandmother)? or scones? Something. I hope you are all having a most beautiful May Day and I hope you were able to wash your face with the May Dew this morning (it is supposed to ensure health for the coming year, and beauty/anti aging benefits where women are concerned). I didn't because let's be honest, it was cold and raining outside when I got up. For more info on May Day go here. Are you sure you don't want to wash your face? Just kidding :) Fun post! Also, the picture on the top of this reminds me of Little Women... where the girls are dancing around that gazeebo type thing. I know it's completely different but that's what it reminds me of! Shannon, Hahaha! well, I gave in and I did wash my face, just not in the beautifying may dew. oooh, I am so jealous of you! I guess that is an appropriate way to celebrate May Day. Lucky! Aw, fun. So I really want to go up into the mountains when we come up to Utah and build a fire and roast marshmallows. Mostly because of your blog. We need a s'more roast off! how fun! i always love it when people celebrate obscure holidays, its what makes america great!